President Donald Trump falsely claimed Tuesday that Republicans would "totally protect" people with pre-existing conditions, and "Democrats will not!" But his comments don't square with the facts and Democrats are seizing on the issue with less than two weeks away to midterm elections. In particular, Democrats are pointing to the Trump administration's decision not to defend the Obama-era law or its protections for pre-existing conditions in court. And they are sounding the alarms on a move this week by the Trump administration that would allow states to circumvent legal requirements on health care insurance plans, even as federal officials insisted Tuesday that those protections remain intact. In a court filing last June, the Trump administration urged a Texas federal court to strike down two specific provisions from the Obama-era law known as the Affordable Care Act: one that requires insurers to cover people with pre-existing conditions, and the other that prevents insurers from charging individuals a higher premium because of their pre-existing condition. Republicans also led a push in 2017 in Congress to pass a health care bill that ultimately would have undermined protections for people with pre-existing conditions. Trump initially pushed for the bill and called "Obamacare" a "disaster," but later called the Republican alternative "mean" in a closed-door meeting with GOP lawmakers. The bill eventually collapsed in Congress. Democrats remained steadfast in their opposition to the bill, in large part because of their demands that insurance companies must be forced by the federal government to cover pre-existing conditions. The Trump administration says it will allow states to pursue “alternatives” to insurance plans even if they don’t meet all the requirements under the Obama-era law. Under Trump's plan, states could use federal money to subsidize cheaper insurance plans that offer less coverage. Republicans call them “innovative” solutions that will improve competition; critics deride the options as “junk insurance” and warn people with pre-existing conditions can still be frozen out. Democrats have swiftly seized on the issue and circulated warnings on social media that such a policy would open the floodgates to insurance plans that deny people coverage based on a previous diagnosis. “Just weeks before the election, Republicans are once again undermining protections for people with pre-existing conditions and sabotaging our health care system,” said Senate Democratic Leader Chuck Schumer of New York. 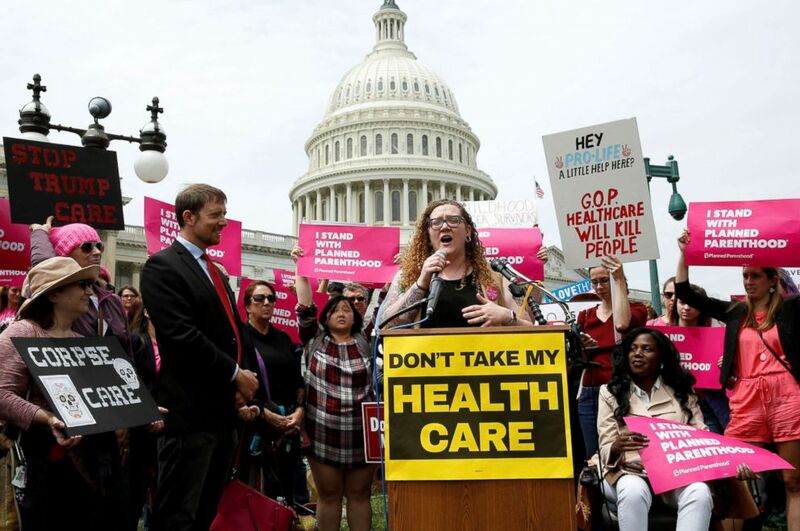 Protesters rally during U.S. House voting on the American Health Care Act, which repeals major parts of the 2000 Affordable Care Act know as Obamacare on Capitol Hill in Washington, May 4, 2017. Trump administration officials contend protections for pre-existing conditions aren’t going anywhere. “No state waivers that would alter or erode pre-existing conditions protections can or will be approved,” Monroe said in an emailed statement to ABC News. But there's a caveat to that claim: Protections for people with pre-existing conditions would only apply to insurance plans sold on "Obamacare" exchanges. Insurance plans sold outside those exchanges, including short-term plans that offer limited coverage, could still exclude or price people out if they have pre-existing conditions. Supporters of the approach say it's unlikely that people with pre-existing conditions would bother buying such a plan, and they point out that such policies exist primarily to support young or healthy people in between jobs. Critics, however, say people who buy "junk insurance" typically don't read the fine print and wind up with sticker shock when they realize how little it covers. What's more is that because cheaper, less-comprehensive insurance plans are likely to attract younger, healthier people, it could make the more comprehensive plans more expensive for everyone else. Jennifer Tolbert of the nonpartisan Kaiser Family Foundation said it's true the administration's approach could provide more affordable health plan options for people who are healthy. "But separating the healthy and the sick will inevitably drive up costs for those who are sick," she said. Seema Verma, who runs the Centers for Medicare and Medicaid Services and is overseeing the latest regulatory push told ABC News on Wednesday that she thinks the criticism is overblown. What else has Trump done? After Republicans failed to push through alternative legislation in Congress, the Trump administration opted for regulatory action. The departments of Health and Human Services, Labor and Treasury have finalized rules that allow for the expanded use of short-term insurance plans, as well as association health plans aimed at lowering premiums for self-employed workers who buy insurance as part of a trade group or employment association. The administration also wants to expand the use of “health reimbursement arrangements,” allowing employers to provide money for employees to cover their medical costs. The Trump administration argues such accounts will attract consumers to the marketplace and lower medical costs overall. Detractors argue the approach could encourage business owners to drop traditional company-sponsored health plans. The latest proposals are risky politically. While the goal is clearly aimed at reducing premiums for voters, any cost savings wouldn't likely be seen by voters by November. In the meantime, Democrats have been pushing the message in tight races that Republicans are “sabotaging” the health care system. Just about everybody. While Trump remains fixated on immigration and the migrant caravan south of the U.S. border, 82 percent of Americans say they consider health care to be a top-tier issue for them this election cycle, according to the latest ABC News/Washington Post poll. That same poll found that by a margin of 53-35, voters say they trust Democrats more on the issue. That could be why Republican candidates across the country have released ads insisting that they would protect insurance for people with pre-existing conditions in particular. In more than 20 competitive districts from California to Iowa to North Carolina, Republicans in tight federal House and Senate races have released new television and digital ad spots that vow to both protect rules for pre-existing conditions and lower health care premiums. That’s a shift when many of the same Republicans, such as Ohio’s Steve Chabot, voted on the now-defunct Republican health care bill that would have eliminated premium limits on those with pre-existing conditions. Still, while health care is a top issue for voters, it's possible that identity politics will play just as big of a role come Nov. 6. The latest research by the nonpartisan Kaiser Family Foundation found that while health care is a driving issue, a large share of voters will be factoring in Trump himself and party control of Congress as well.